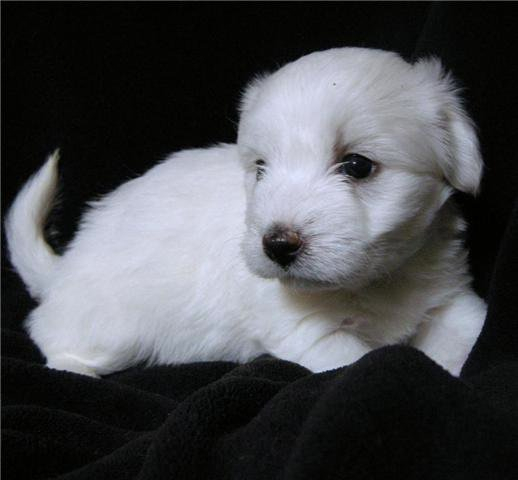 Two years ago- almost to the day- I brought home a puppy destined to be my best friend- his name is Casper. My biggest concern with these cupcakes was of course the tremendous amount of icing on them—YUCK! I decided that mini cupcakes turned upside-down on top would bump up the center and reduce the amount of icing needed. My second concern was the icing itself. A heavy buttercream would work- but a little of that goes a long way. Yum! I need a bite of that! One box of white cake mix (I use Duncan Hines) with water, oil and eggs to make according to package. mini M&Ms or black/brown icing coloring. Make cake according to package and make as cupcakes. Only make about 16-18 cupcakes though and use the rest of the batter in a lightly greased mini-muffin tin to make 16-18 mini cupcakes (with no liners). While cupcakes are baking make frosting. Combine Dream Whip, milk and powdered sugar in a large bowl and beat on high until it is very stiff (whipped frosting consistency). Refrigerate until use. Divide about 2/3 of the frosting off into a zip-top bag that has a corner clipped off and a decorator tip inserted in the opening. Refrigerate. If you aren’t using mini-M&Ms for eyes and nose, pull about 3T of frosting out and color it black or brown with icing color. Place this in a zip-top bag as well with a tip inserted. Refrigerate. 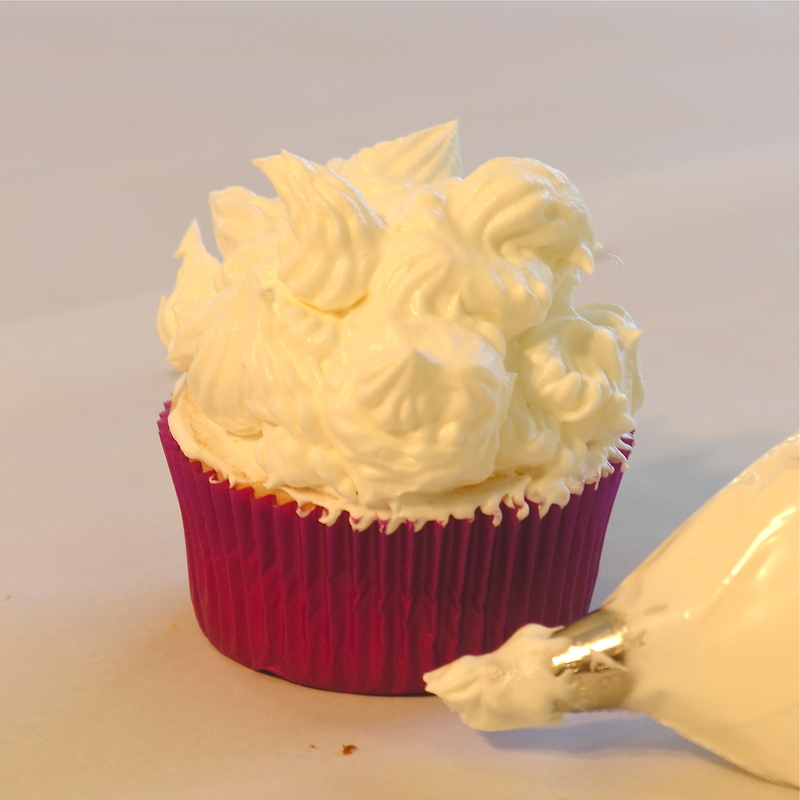 Use the rest of the frosting to frost the top of each large cupcake. 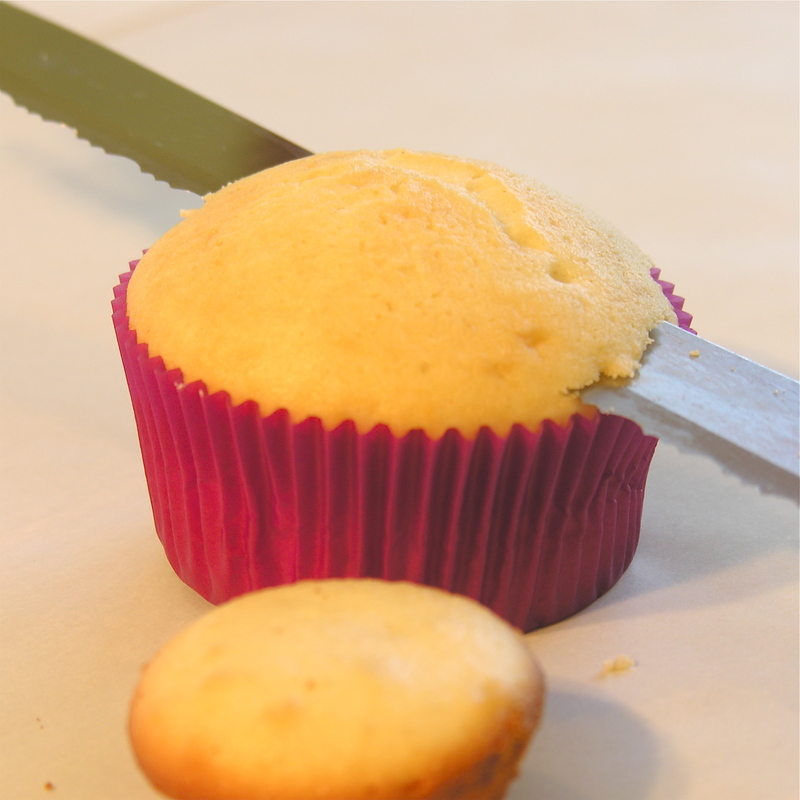 Tip the mini cupcake upside-down on top and frost that as well. 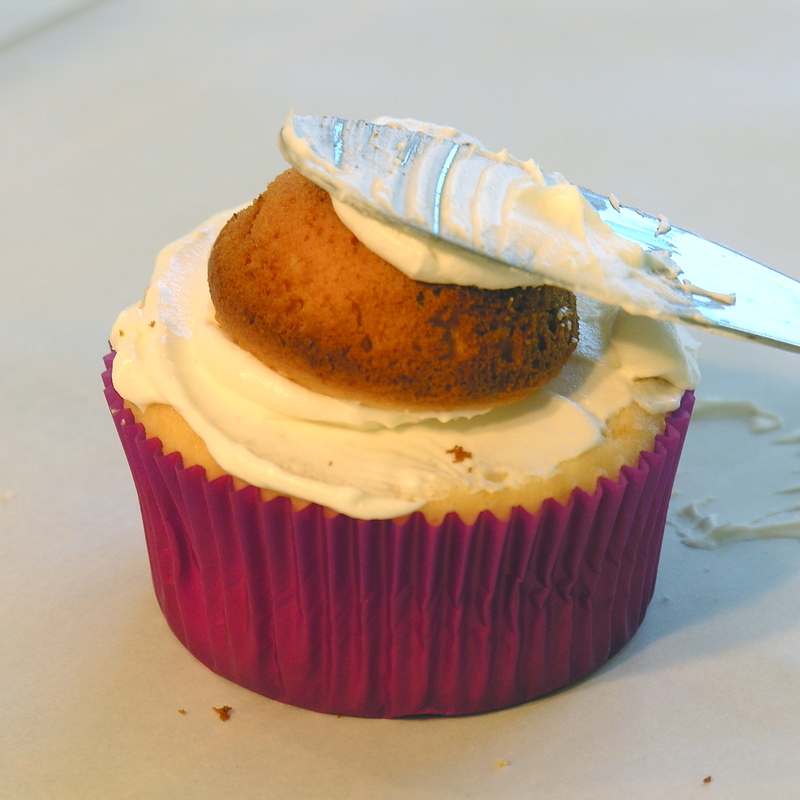 Using the bag of icing with the decorator tip, pipe icing on making little points coming up from the cupcake. 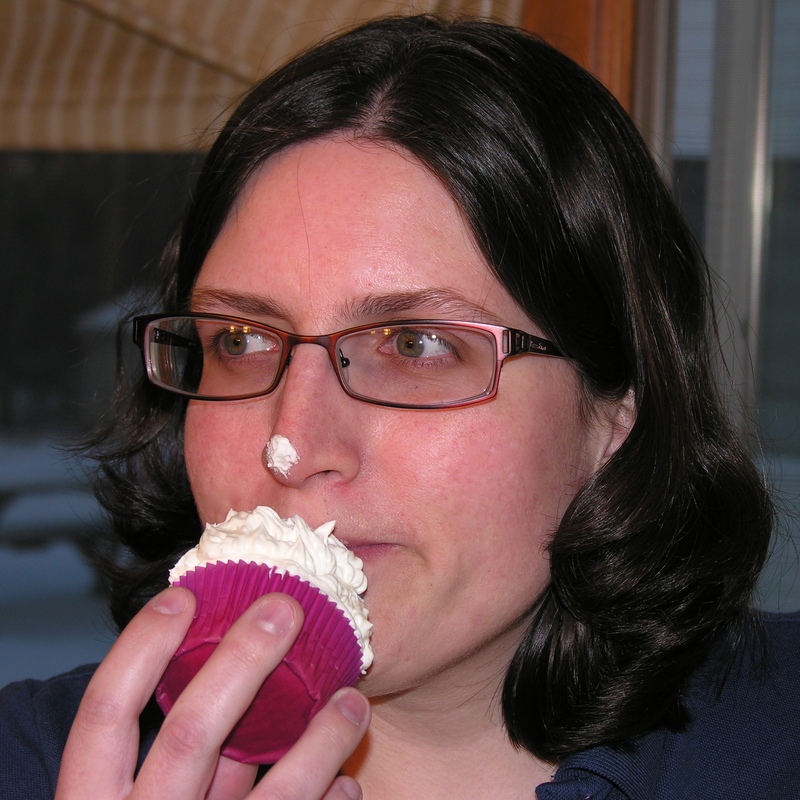 make a larger dollop of icing for the nose and two off the top and folding over a bit for ears. Take the bag of black icing (or your mini M&Ms) and make eyes and a nose. My thoughts: You could certainly use a couple of cans of frosting for this if you want. The light whipped frosting is SO tasty though. These cupcakes are easy but time-consuming. I’m no cake-decorator, so I loved that these are so free-form….just have fun! Here’s some more photos of Casper and my friend Danielle enjoying the finished result (they BOTH have frosting on their noses!) 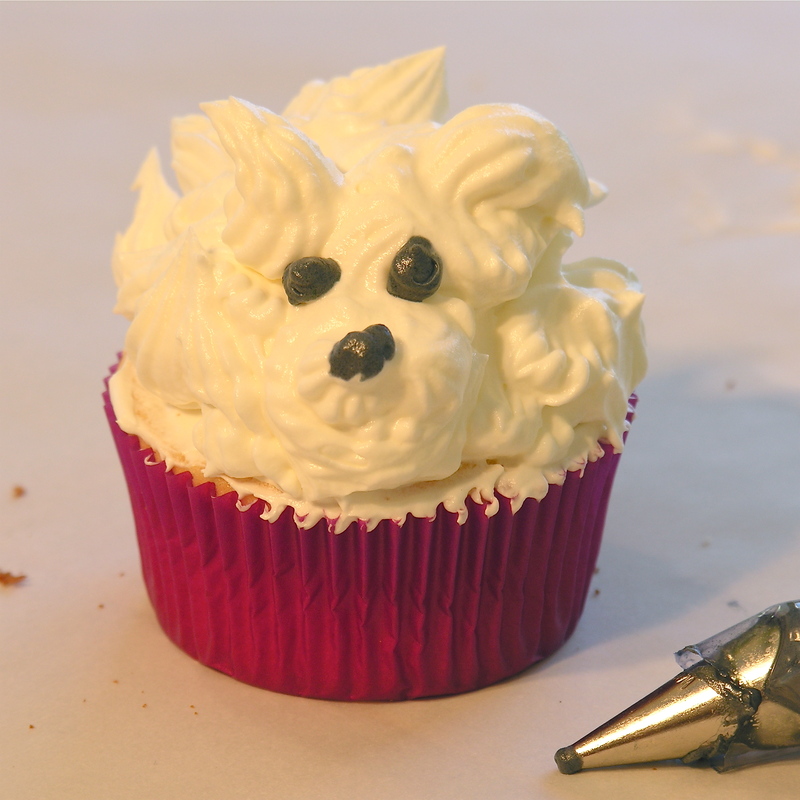 Only little tastes for puppies though– these are cupcakes designed for people and feeding them to your pets could make them sick. Have you seen Casper in my other recipes? Check him out in Coconut Lemon bars with Mimi and Fresh Blackberry Tart. 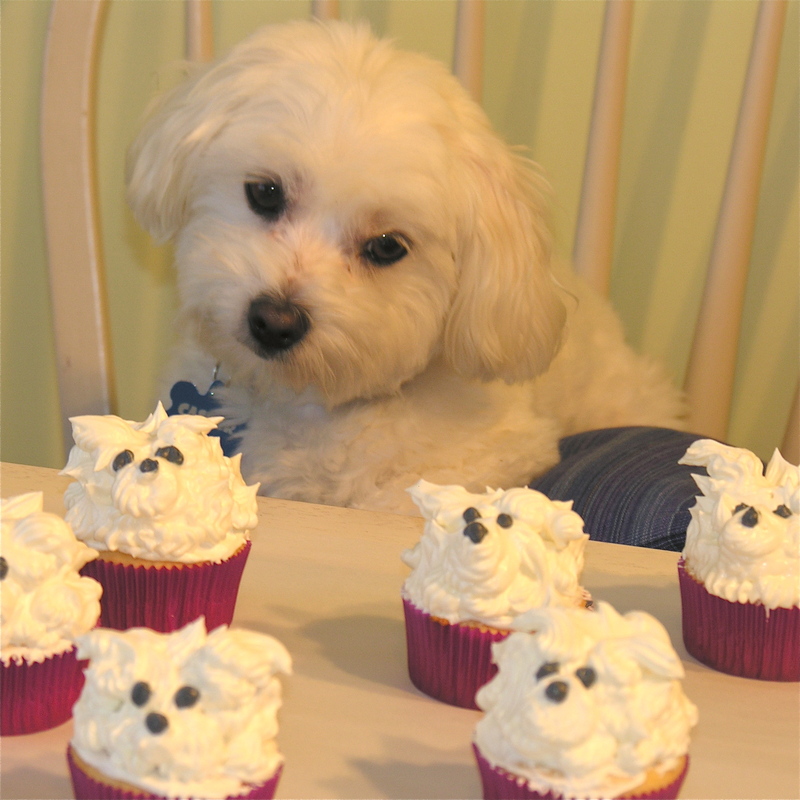 Posted in Cupcakes and tagged baking, creative desserts, cupcakes, decorator tips, dessert, dog cupcakes, dogs, whipped frosting, white cake mix, white dog cupcakes. Bookmark the permalink. ADORABLE!! And I love the one where he’s like, ‘I want that!’ =) too cute! Dog are not suppose to have those ingredients. I own a dog bakery! 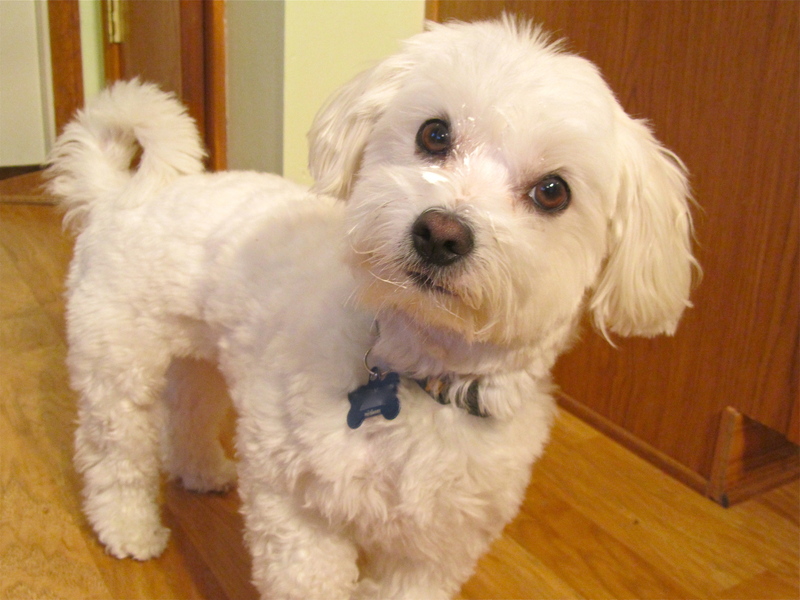 Dogs cannot have sugars, and boxed store cake mixes. So are these for humans or our furry friends. 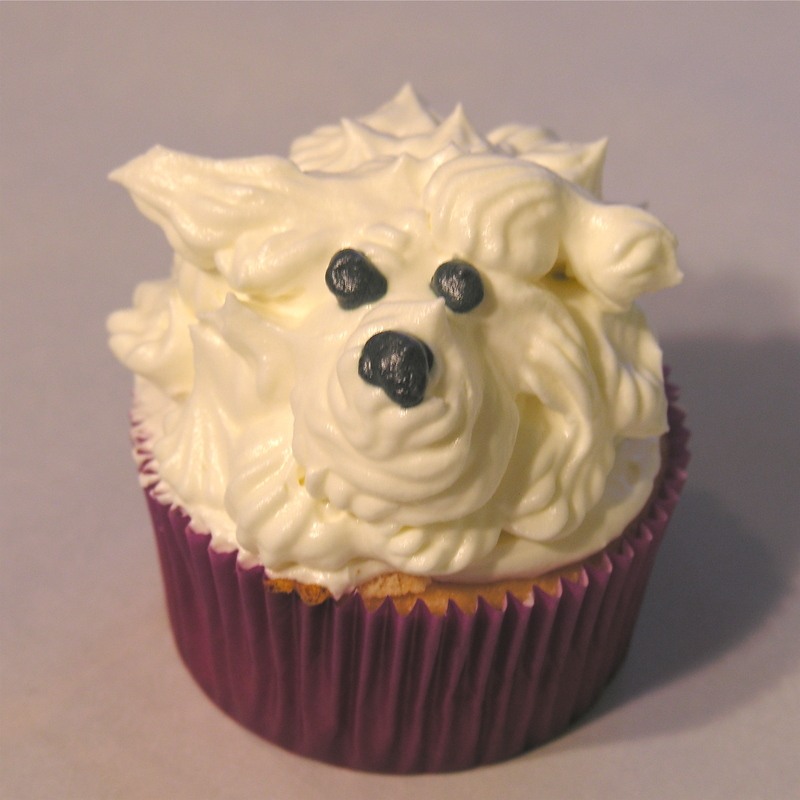 If its not for our furry friends then the title Dog Frostings should be correctly changed. It is misleading. Thanks Robin! I’ve never even heard of a dog bakery– but that sounds really fun! 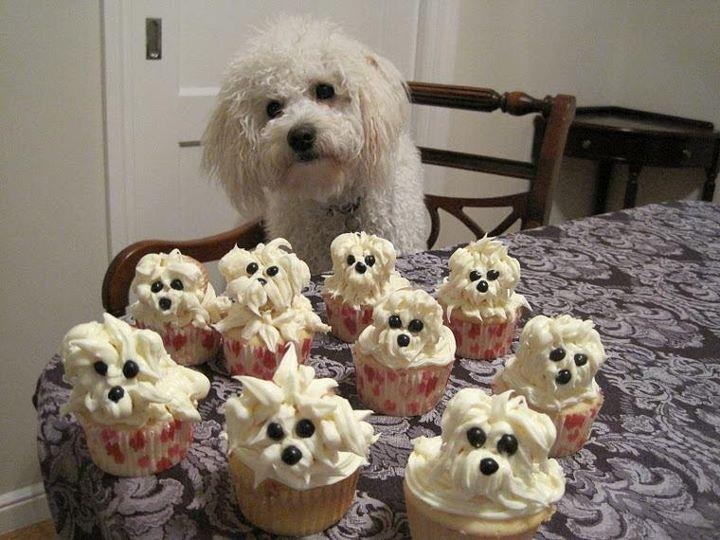 These are human cupcakes –although my dog did get a taste of my frosting! I don’t have any recipes for animals on easybaked– only ones for humans! Hope that clears things up for you! 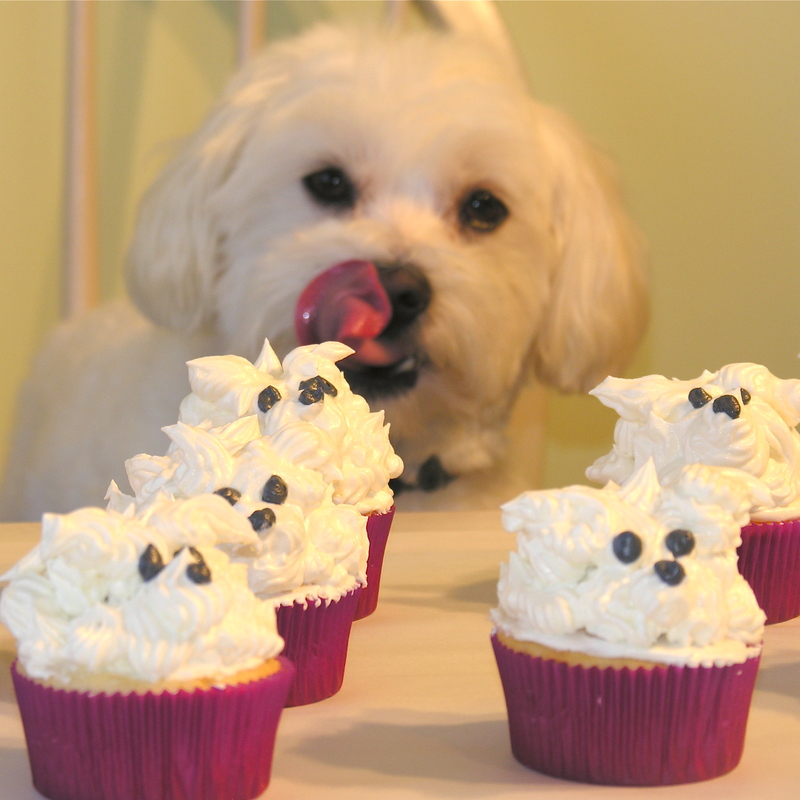 Great cupcakes but I REEEEally love the puppy! What breed is he? This so cute and you did a great job! What great photos (and thanks for the recipe). He would have a lot of fun with my 102 pound Irish Wolfhound look-alike, Gracie who thinks she’s a lap dog! Those are genius. And I love that puppy picture! This is soooo adorable. And also, delicious. My two favorite things–cute puppies and food. These are the most adorable cupcakes ever, sooooo cute! i cant get over how adorable these are !!!! wow !!!!!!!!!!!! 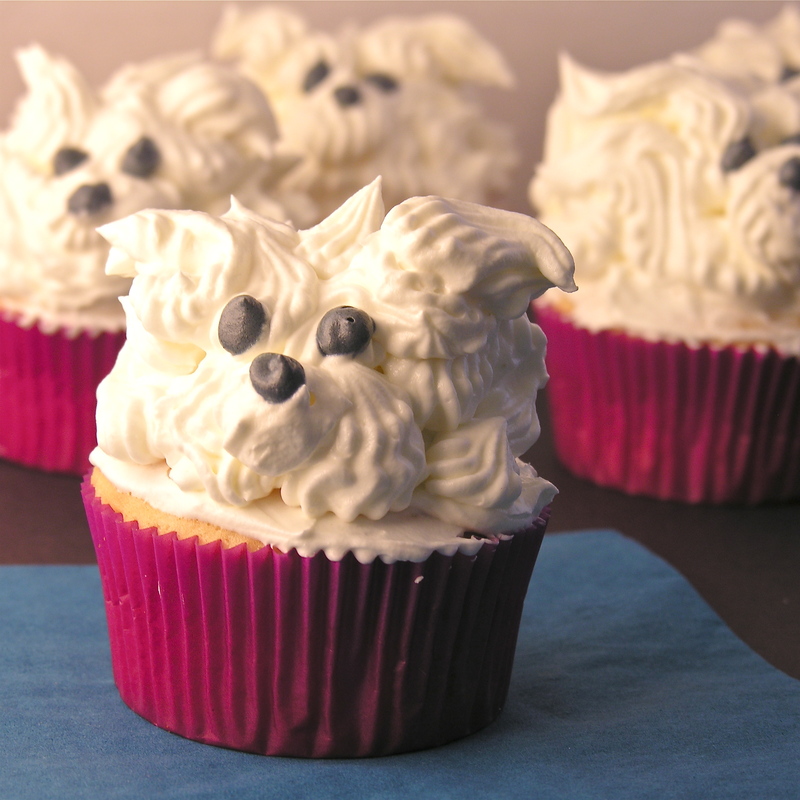 The idea for the doggie cupcakes are from a Cupcake cookbook published at least 3 years ago. I can’t remember the name but she is a genius! She uses marshmallows or a mini cupcake on its side for faces, heads, and etc. and then decorates that with icing. They are not solid icing! Then she decorates them with candy-coated sunflower seeds in fun colors (available in gourmet food stores) for the eyes, nose, and etc. They are sharper than chocolate chips and just look more polished. You should see her corn-on-the-cob cupcakes or the Van Gogh “Starry Night” painting made with cupcakes. Gorgeous! 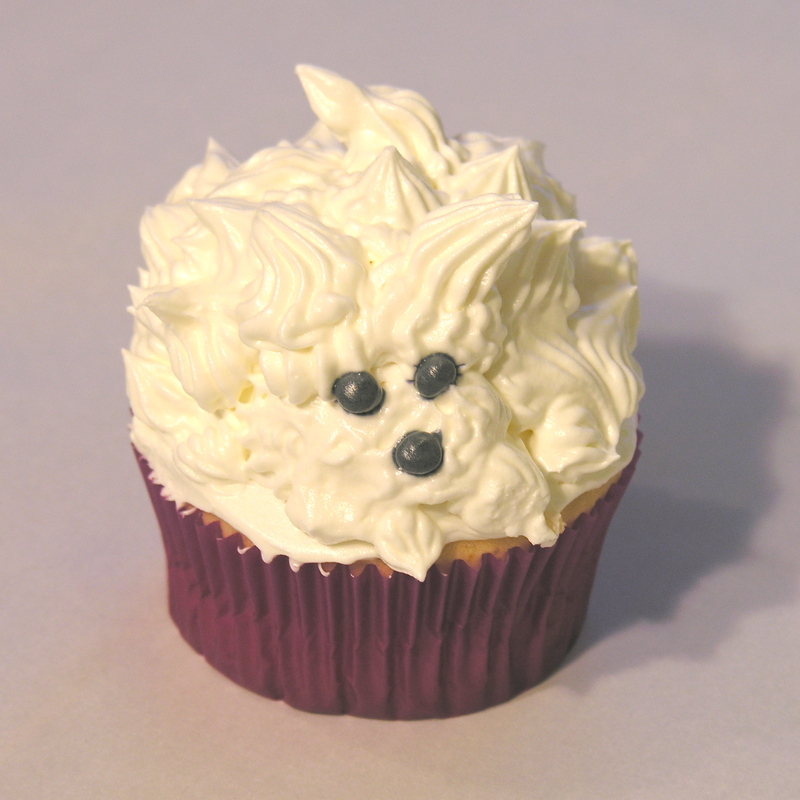 And of course all the pet cupcakes are so adorable with real edible leashes and everything. and you are right– wow….I want to get it now!!! Thanks! 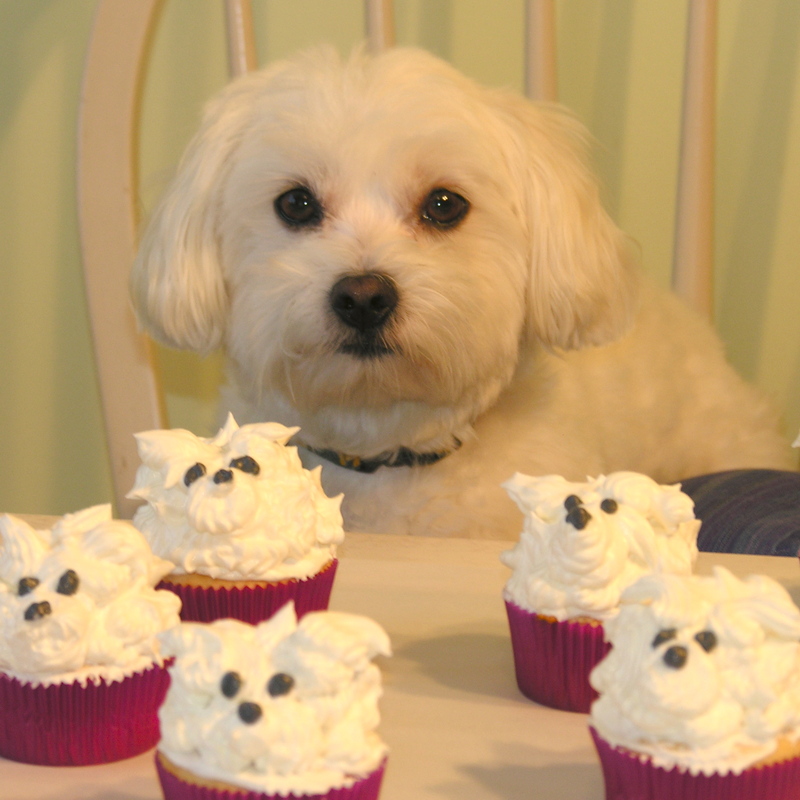 The original photo is from Buster Cupcake – that little dog is named Buster – he had dinner at our house with his mom and dad, Andrea and David, last night! Andrea is an incredible baker. Awwww—- he’s so cute 🙂 Thanks so much for letting me know- I’ve been wondering who to credit! Hey, great ideas! So creative! I would really like to showcase this recipe on my cupcake recipes and ideas blog if you agree. Yay 🙂 thanks for letting us know!